how can they be developed? Access to the waterfront is important to Mudge Island residents. The foreshore is used for walking, beachcombing, swimming, bird and wildlife viewing, fishing and boating among other activities. There are 27 public water accesses on Mudge Island. Over the past few years, residents have become increasingly concerned about encroachment of water access rights-of-way by neighboring properties; another concern is the lack of signage to identify the location of these foreshore accesses. Public access to the waterfront is provided along road rights-of-way that end at the foreshore. In regional districts the rights-of-ways are owned by the Province and are under the jurisdiction of the Ministry of Transportation and Infrastructure (MOTI). MOTI does not take an active management role over undeveloped water accesses. Some residents have asked that the Regional District of Nanaimo (RDN) get involved in signing, developing and managing water accesses in key locations. Each Electoral Area within the RDN pays for its own water access "park" development through its community parks budget. 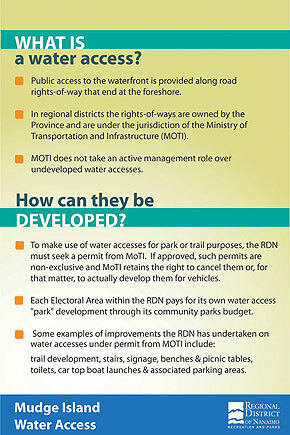 Some examples of improvements the RDN has undertaken on water accesses under permit from MOTI include trail development, the installation of stairs, signage, benches and picnic tables, toilets as well as car top boat launches and associated parking areas. Mudge Island residents completed an inventory of public water accesses in 2005 which describes all the water accesses and makes suggestions with respect to possible improvements. In November/December 2012 residents were asked to review this inventory and to complete a survey regarding the water accesses in order to help prioritize potential development opportunities they may want the RDN to focus on. The compilation of survey responses can be viewed HERE. In May 2013 an Open House was held on Mudge Island to discuss the results of the survey with Area 'B' Director Howard Houle, Parks and Open Space Advisory Committee members and RDN Parks staff. 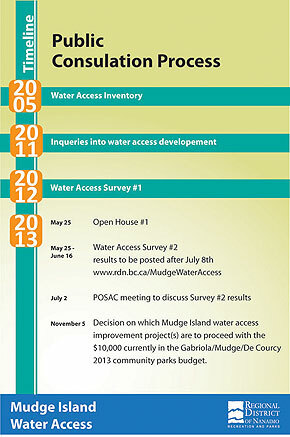 Mudge Island residents were asked to complete a second survey to clarify the water access development priorities which were identified as a result of the first survey. (The survey is open until June 16, 2013). Once the water access priorities have been confirmed with Mudge Island residents, staff will prepare a preliminary work plan for the Mudge Island Water Access Improvements and present it to the Parks and Open Space Advisory Committee at their scheduled November 5th, 2013 meeting. For more information please contact Elaine McCulloch at emcculloch@rdn.bc.ca or toll free at 1-888-828-2069.